There are any number of apps and websites dedicated to testing your current data speeds, but for the most part that’s all they do. Meteor aims to add context, not only telling you your download speed, upload speed and ping, but also telling you the implications of that for the apps you use. Meteor will tell you the overall performance you can expect from YouTube, Spotify, Facebook, Waze, Google Maps, Skype, Amazon, Dropbox, Chrome, Flipboard, Gmail, Instagram, Google Street View, Twitter, Uber and WhatsApp based on your current results. 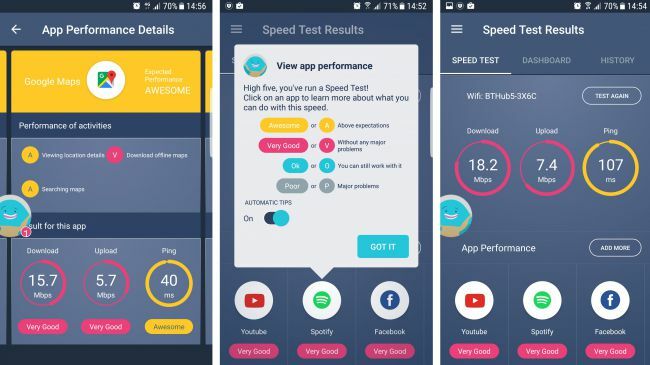 It can assign ‘awesome’, ‘very good’, ‘OK’, or ‘poor’ ratings to each app, and also gives one of those scores to the overall speeds you’re getting. But if you want more detail you can tap on an app and see the same ratings for individual activities. For example, if you tap on YouTube you’ll see separate ratings for different streaming qualities. The ratings are all color coded too, so you can see them at a glance, and the app is attractively laid out, with separate tabs for your test history. The only small fault we can see is that the number of apps it can provide performance information for isn’t larger, and that, for some reason, you can only choose to see information for six of the current selection at any given time. But Meteor has only just launched, so it’s likely to improve over time.